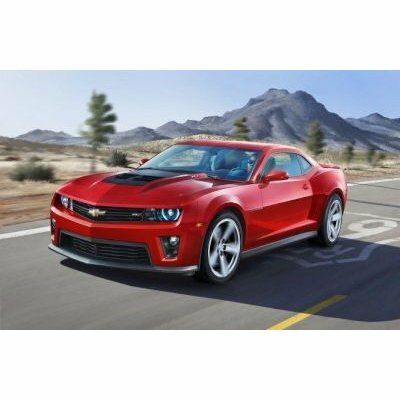 According to Chevrolet the name Camaro is derived from the French word camarade , which can be translated to mean comrade or friend . In production since 1967 the Camaro has more than lived up to its name. Whereas the first Camaros were just muscle cars the new ZL1 really does show its muscles. 580 bhp delivered from a 6.2 litre V8 engine unleashes a fearsome 750 newton meters (553 ft/lbs) of torque onto the rear axle. After only 4 seconds the speedometer sweeps past the 100 km/h (62 mph) mark as it continues to climb right up to 290 km/h (180 mph). Thanks to state of the art technology in the chassis, these forces are held in check in the true style of European sports cars. With the new Camaro ZL1, General Motors has stood a super sports car on its rubber slicks which, thanks to its affordable price is also competitive in Europe. An ideal kit for beginners and people returning to the hobby: all body-parts are pre-painted. Further painting or decorating of the bodywork is not necessary, but can be undertaken according to the enclosed instructions.